It’s another double post day! As mentioned earlier, my MPB Men’s Shirt Sew-Along fabrics arrived AND my Colette Patterns Negroni pattern was waiting in my mail box when I arrived home from work! Wow, what a wonderful pattern company, I love the detailed instructions, helpful hints, format & layout and style! Leafing through it, you just know you’re looking at something special. To refresh your memories, my plan is to create Robert Graham-esque shirts. A big shout-out to TonicLiving who delivered the fabric in one day! I was worried about the size of the pattern on the paisley fabric but I LOVE it. It’s such a detailed, colourful, decadent print, I think I’m going to buy more for another project for myself! 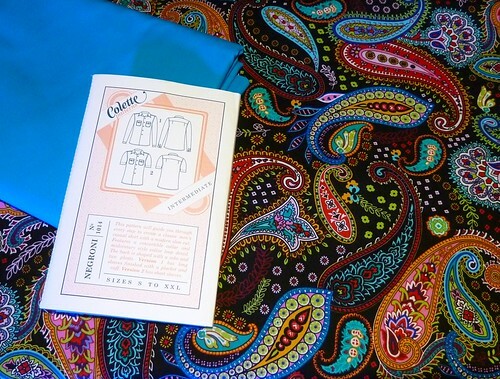 So the last thing I’m waiting for is my order from Joanne’s Creative Notions and I’m all set for Peter’s Sew-Along! This entry was posted in Fabric, Robert Graham, Shirtmaking by Tabatha. Bookmark the permalink. oh, wow, I love both of those! I was so tempted to buy that pattern, but I have 3 or 4 men’s shirts patterns I haven’t tried yet, so I went with practical…if you can classify that groovy 1970s shirt pattern as “practical”. I love both of your fabric choices! That black paisley is spectacular and I do adore Robert Graham shirts…will you be doing any embroidery? I’m so excited to get started! WOOT! The Colette patterns are expensive (almost $20.00!) but the quality is very nice and worth every penny. It’s nice to meet someone familiar with Robert Graham, were your fabric choices also inspired by his shirts (I’m guessing yes)? I’m excited to start too, W00t! I love the paisley. Can’t wait to see your shirts! Can’t wait to see how these turn out. Great fabric! RG is a big influence to my tacky taste. 😉 are you gonna share your fabrics on Peter’s flickr group? All my fabrics and patterns are up on flickr, linked from MPB’s sew-along flickr group.